Last time on RulesFest we talked about the basic mechanics and game theory of playing and winning a Round of Gambling at the Red Dragon Inn. Today we’re going to cover many of the corner cases that throw a wrench into the game. Many of the cheaters in The Red Dragon Inn have a special Cheating Card called “What’s that up your sleeve?”. This powerful card not only gives you control of the Round of Gambling, but it also forces another player out of the Round. Eliminating the Competition: If you are in a Round of Gambling against another very strong Gambler, using this card to kick them out of the Round will significantly increase your chances of taking all of that sweet Gold for yourself! Winning the “Game after the Game”: Another great way to use this card is to kick out the player who needs the Gold most! Characters who are strong with Gold frequently find themselves in positions where it really isn’t important whether or not they win a Round of Gambling. Rather, it’s more important that one specific player doesn’t win the Round (like the fighter with only 2 Gold left). Kicking that player out of the Round guarantees that they don’t get that Gold they so desperately need! Auto-Winning a Head-to-Head Round: If you find yourself playing against only one other player, playing this card against them almost guarantees that you win! Strategically taking advantage of this kind of card may not just win you a pile of Gold, but also set up one of the other players for elimination! With all of the advantages that cheating characters have, you’d think that the deck would be stacked against non-cheaters. However, almost all of the non-cheaters are equipped with a magic bullet of their own to help deal with runaway Rounds of Gambling. These special Sometimes Cards are played in response to another player playing a Cheating Card, and can win you the Round of Gambling right then and there! These “catch a cheater” cards are very powerful when they are played at the right time, and can save you from disaster and completely flip the game on its head! They can’t protect you forever, though, and can also be negated by “I don’t think so!” cards. Plus, they come with the drawback of being VERY situational, which means you are sacrificing a spot in your hand to deal with something that may never come up! Do you keep it to protect yourself, or discard it so you can draw more Fortitude loss Action Cards? Making the right call at the right time can define the game! The card to the left is perhaps the most spiteful card in the game, and one of the ones that gets misplayed most frequently. 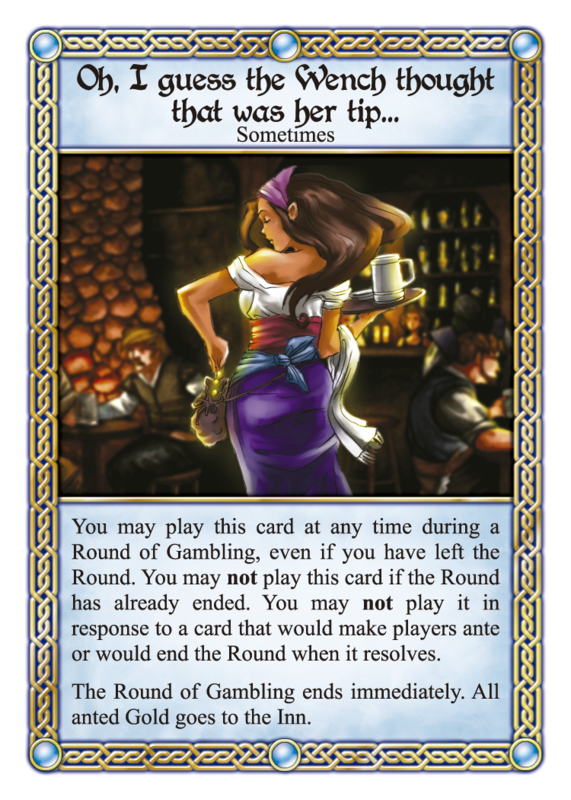 “Oh, I guess the Wench thought that was her tip…” is the ultimate “Back at you!” response to getting kicked out of the Round, or your opponent playing an unexpected Winning Hand! that you can’t beat. This card abruptly ends the Round and gives all of the Gold to the Inn. This is one of the best ways to beat your opponents on Gold, as it completely eliminates a LOT of Gold from the game in one fell swoop. You may not play this card if the Round has already ended. You may not play it in response to a card that would make players ante or would end the Round when it resolves. You may not play this card in response to Gerki playing “Um… I know you think you won, but…” because that card will end the Round when it resolves. You may play this card in response to Dimli playing “Best two out of three?” because the Round is not over yet, just restarting. You may not play this card in response to someone starting a Round of Gambling with ”Gambling? I’m in!” or forcing more Gold into the pot with “I raise!”. You have to wait until each player has finished paying the ante or getting out of the Round first. You can’t use this card to get out of paying! You may play this card in response to someone forcing you out of the Round, even if only two of you are left in the round (and therefore the Round would end if you leave). You may not play this card in response to another player playing one of the “catch a cheater” cards. Those cards always end the Round. Besides, the Wench is smart enough to avoid a table with adventurers shouting and swinging their swords. You may not play this card after the last player passes. As soon as that player passes, the Round ends and the last player who played a Gambling or Cheating Card wins! No fair playing this card as the winner is reaching for the pot! All that being said, this is a favorite card for characters who get an early Gold lead and don’t necessarily need to win Rounds of Gambling anymore. Remember: at a certain point, you really don’t need more Gold. You just need your opponents to have less of it! 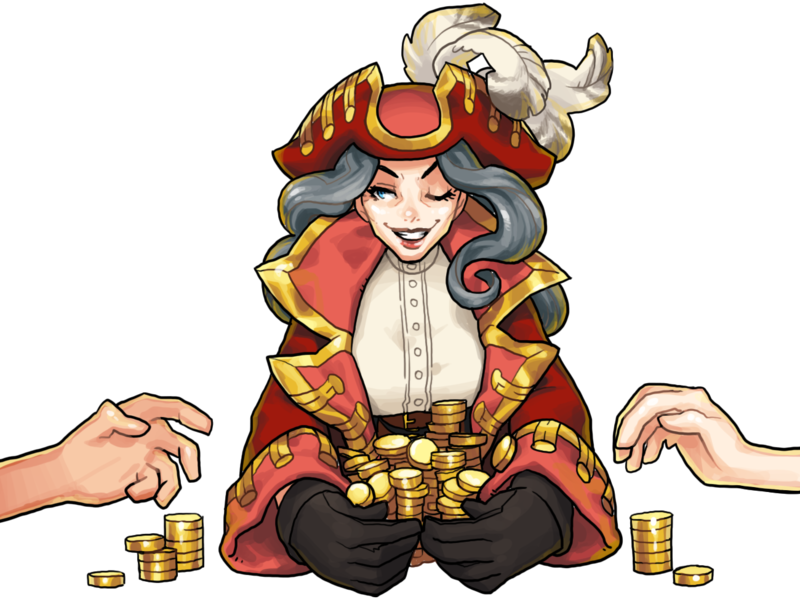 Keet changes the way players approach gambling in one very interesting way. Instead of Gold, Keet pays for things with powerful Artifact Cards! At the start of the game, Keet is dealt 10 random Artifact Cards face down, and will be revealing them one by one whenever his cards let him finish his research. Many of these Artifacts are good for the adventurer, giving them a unique bonus or special power, but others can be very bad. Worst of all, Keet will probably just ante with face-down Artifacts – after peeking, of course! It will be up to the other players to decide if taking a Cursed Idol of Doom is worth winning the Round of Gambling, or if Keet will be successful in scaring players out of the Round with his most dangerous Artifacts. Keet is available now as the SlugCrew Major Reward and you can find out how to earn him here. That wraps up this week! Armed with all of this knowledge, maybe it’s time to try out one of these Gambling-centric characters. Just make sure you don’t win too much, or you may end up getting dogpiled by all of your less “fortunate” friends!